The Trent Swivel Seat Bar Stool offers a rich, inviting stool seat and the luxurious look of solid wood to grace your kitchen counter, bar or pub table. 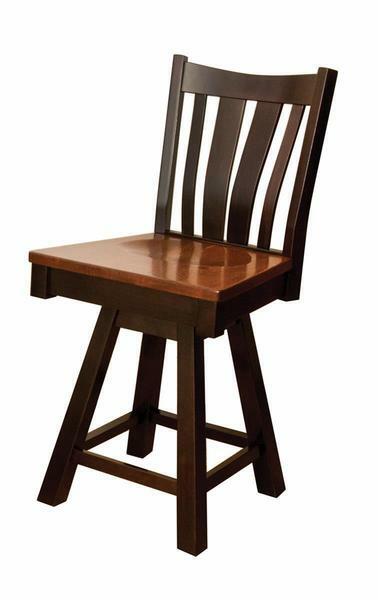 Select the size that fits your dining area, then sit and swivel in comfort with this expertly designed Amish barstool. The added height of the Trenton Swivel Barstool will provide plenty of room to sit comfortably as you dine or gather for drinks. Each Amish barstool is inspected and hand sanded before being finished. Be sure to view our extensive collection of Amish Bar Stools & Counter Chairs to find the one that best reflects your personal style. We love the versatility that wood bar stools offer. Add fabric and they adapt easily to a change in the decor of the room. Create additional seating at your kitchen counter when the kids bring friends home for pizza. They support casual dining and are perfect for both small apartments with a kitchen counter area to eat at or your home or business. Shown in Brown Maple in OCS-230 Onyx stain & Rustic Quarter Sawn White Oak Seat in OCS-117 Asbury.